The people at Wine Automotive love dogs as much as anyone. Therefore, we want to let you know what to look for if you want to travel with your canine companion. 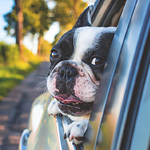 Ideally, your vehicle will have a backseat climate control feature that makes it easy for your pet to stay cool in hot weather. Furthermore, the car should have a seat that is as low to the ground as possible. This makes it easier for your dog to get in and out of the car without putting too much strain on their joints. Sliding doors can also make it easier for a dog to get in and out without a lot of trouble. Finally, a car with a doggy gate can be one that canine owners should strongly consider. It allows you to keep the dog safe and secure during any trip to the beach or park.